Our girls are encouraged to apply themselves in a variety of activities away from their desks, beyond the classroom. These are designed to be rewarding and mutually beneficial physically, mentally and socially. 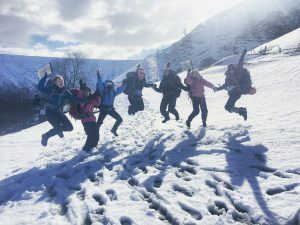 Whether as part of the curriculum or our enrichment programmes, girls can take part in a variety of outdoor activities, including D of E, outdoor exploration and scaling the heights of the climbing wall. Taking part in outdoor activities helps build character, stamina and resilience, while promoting leadership and teamwork skills. It’s also a lot of fun! Our House system is also a big part of our Sixth Form community and allows girls the opportunity to become role models for the younger girls as they take up positions of leadership and encouragement such as House Captain. This can be a lot of fun as they support and cheer on the younger girls in a whole host of House activities. 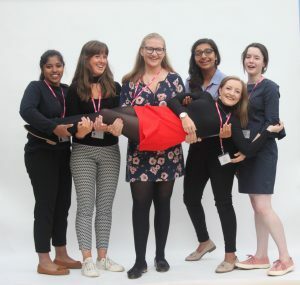 There are many ways outside the classroom in which Sixth Form girls can experience responsibility for others through elected AND voluntary roles. Becoming an ambassador, running a club, taking on the role of prefect and even Head Girl – these are all roles which give girls a sense of pride, duty and leadership. A multitude of challenges and competitions, internal AND external are also on offer to stretch the girls further and see their efforts rewarded with prizes and accolades. Together with a myriad of charity and volunteering opportunities, giving our girls the chance to experience community life and put something back – we really have covered every angle, every life skill that our girls need to take on the world. Academic success is only part of the story.